In September, 1950, Mary Deloatch stepped into a New York City recording studio, strapped on her guitar and, surrounded by musicians that included pianist Devonia “Lady Dee” Williams and drummer Johnny Otis, belted out “Beer Bottle Boogie” under her stage name of Marylin Scott. Later that same session, with only Williams and Otis to accompany her, Deloatch reverted back to her given name and recorded a gospel song called “I Want to Die Easy.” Both songs were released on Regent Records. A few years later, Newark, New Jersey native Cynthia Coleman led her gospel group, the Colemanaires, on a recording of “Joy in the Prayer Room” for the Timely imprint. In 1956, as Ann Cole, Cynthia recorded Preston Foster’s “Got My Mo-Jo Working.” Her version is purported to have inspired blues great Muddy Waters to record his own. These examples point to an obvious reason for the symbiosis between gospel, rock, and soul—sometimes the artists were one and the same. And when they weren’t, sometimes the studio musicians were. Most pop music enthusiasts know that Sam Cooke, lead singer of the Soul Stirrers gospel quartet, traded in his shouting shoes for a pair of rock ‘n’ roll shoes. “Lovable,” his first commercial pop single, was released under the nom de plume of Dale Cook. It fooled no one. Cooke’s trademark yodel was recognized instantly by his church fans, who felt betrayed when he left holy music for Hollywood. It didn’t help that “Lovable” was a nearly note-for-note secularization of “Wonderful,” a 1956 Soul Stirrers single that Cooke led. Gospel quartets who became successful recording artists were routinely persuaded by label chiefs to make pop records. Though most remained in gospel, a few tried to penetrate the secular market. The Five Royales, for example, whose “Dedicated to the One I Love” was a hit for the Shirelles and the Mamas & the Papas, initially recorded gospel as the Royal Sons Quintet. The Violinaires of Detroit cut a few interesting but ultimately unsuccessful vocal harmony sides for JVB as the Gales. With future soul crooner Lou Rawls, the Pilgrim Travelers gospel quartet recorded rock ‘n’ roll as the Travelers. And in 1951, New York’s storied Selah Jubilee Singers released the vocal group classic “My Reverie” as the Larks. But even gospel artists who remained firmly rooted in the church could find themselves moving and grooving like their secular counterparts when their backing musicians were professional jazz, R&B, or rock ‘n’ roll studio players. Working on shoestring budgets, independent record companies were not in a position to pay princely prices for studio time, only to have it wasted because amateur musicians required retake after retake. They preferred to use their own studio musicians who could get the job done expeditiously, and whose sound was already proven in the marketplace. It was thus inevitable that the more cosmopolitan style of seasoned studio musicians would creep into sessions by even the most traditional of gospel singers. For example, in 1949, Dave Dexter, head of Capitol Records’ Rhythm & Blues Department, deliberately teamed gospel pioneer Sallie Martin and her adopted daughter, Cora, with a swinging jazz combo consisting of Joseph “Nappy” Lamare on guitar, Leonard Bibb on bass, and Zutty Singleton on drums. Guitar-toting gospel innovator Sister Rosetta Tharpe sang with Lucky Millender’s Orchestra in the 1930s and 1940s and was frequently accompanied on record by a jazz combo called the Sam Price Trio. Studio drummer Joe Marshall backed Del Shannon on his 1961 “Runaway,” and also accompanied the Angelic Choir of the First Baptist Church of Nutley, New Jersey on its early sides. Mickey Baker (of Mickey & Sylvia) put stinging electric guitar licks in Marie Knight’s 1956 “The Storm is Passing Over,” as jazz drummer David “Panama” Francis pounded out the rhythm. Chicago-based Chess, Vee Jay, and Halo Records often used the same studio musicians regardless of genre. 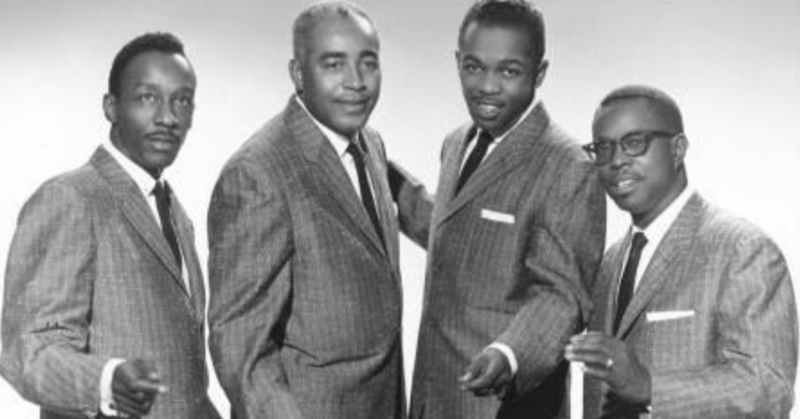 On “Father Don’t Leave,” the flipside of the Silver Quintette’s 1956 gospel single for Vee Jay, “Sinner’s Crossroads,” the label’s house band rocks like a hurricane, especially the drummer, probably Paul Gusman, whose backbeat echoes off the walls of Chicago’s Universal Studio. At Chess, it was not surprising for such leading lights as Leonard Caston, Phil Upchurch, Louis Satterfield, and Willie Dixon to support a gospel group or quartet with the same verve it employed to back R&B singers. Dixon’s upright bass work on the Pilgrim Jubilee Singers’ 1959 “Stretch Out” for Peacock Records made the bass guitar all but compulsory for quartet recordings and live appearances henceforward. Just up the street from Chess’s Michigan Avenue studio was George Leaner’s One-derful! Records. Under the direction of A&R man and producer Monk Higgins, the label produced 1960s hits by soul artists such as McKinley Mitchell, Otis Clay, Betty Everett, and the Five Du-Tones. The same professional studio musicians who played on the label’s soul sides backed artists who recorded for One-derful!’s gospel subsidiary, Halo. But turnabout was fair play. The Reverend Maceo Woods, whose 1954 organ instrumental “Amazing Grace” was a best-seller for Vee Jay, often did studio work for the label, playing organ on secular and sacred sides alike. At Chess, Geraldine Gay Hambric, piano accompanist for her family’s gospel group, the Gay Sisters, was tagged to play on Mel and Tim’s 1969 hit, “Backfield in Motion.” As Hambric told this author: “I was [at the Chess studio] playing for my sisters. And this guy came in and said, ‘Miss Gay, I hate to take you up from the piano, but would you just go through this song, “Backfield in Motion” for me?’ I said, ‘I don’t even know it.’ He said, ‘It’s very easy. You can play anything!’” With encouragement from her sister Evelyn, Hambric learned the song and accompanied the duo. Distinctions between R&B, soul, rock, and gospel often have more to do with lyric content, marketing, and artist intent than musicology. As Pearl Williams-Jones pointed out in 1975, many components of African American popular and sacred music hearken back to the West African countries that were home to those who were enslaved and brought to the Americas. In West Africa, there was no distinction between the sacred and the secular. The same tune used to praise the gods also celebrated human achievement. Through oral tradition, techniques such as handclapping, foot patting, falsetto singing, improvisation, and polyrhythm have been handed down from generation to generation. These can be heard in gospel, rock, soul, R&B, jazz, blues, and hip hop. There is no doubt that the African American church has been, and continues to be, one of the great schools of music. Countless artists, whether soloists or session musicians, whether gospel, rock, or soul artists, can point to the church as giving them their first public exposure to music. So in the end, perhaps it really does come down to Louis Armstrong’s comment that there are only two types of music: the good and the bad.